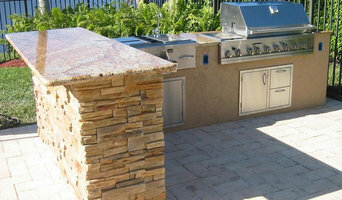 Florida Granite is the leader in fabrication and installation of natural stone countertops. With over 20 years of experience installing countertops for kitchens, bathrooms, conference rooms, office settings, fireplace surrounds, outdoor kitchen and bars and more, we can proudly say that we’ve made installing countertops a science. We offer a wide range of products related to natural stone fabrication: kitchen countertops, vanity countertops, jacuzzi and fireplace surrounds, full wall and floor paneling, backsplash and floor tile – Florida Granite can supply design, fabrication and installation for any project. Our goal is serve any of your stone needs. We work with homeowners, developers, property management companies, custom home builders, interior designers and decorators on residential and commercial projects. We are thorough, responsible and customer-centric.Environmentally Conscious. There are so many options when it comes to stone products. Not only are the materials environmentally friendly but the many options for you to choose. We have a full line of eco-friendly and environmentally friendly products to choose from. In addition to basic surfaces, many Hollywood, FL tile, stone and countertop contractors can create and install murals and mosaics, as well as add decorative edge treatments to countertops. They also repair or replace surfaces in the event of chips, cracks, stains or other damage. Many tile, stone and countertop professionals also install shower pans, radiant-heat flooring systems and other common components of surfacing jobs, often working in tandem with Hollywood, FL plumbers or other professionals. Here are some related professionals and vendors to complement the work of tile, stone & countertops: Interior Designers & Decorators, Architects & Building Designers, General Contractors, Kitchen & Bath Designers, Design-Build Firms. Find a tile, stone and countertop contractor on Houzz. Narrow your search in the Professionals section of the website to Hollywood, FL tile, stone and countertops. You can also look through Hollywood, FL photos to find tile, stone and countertop projects you like, then contact the contractor who worked on it.